Following trails of clues and asking Muscovites for information are part of the visitor experience with a new generation of tour guides. Hugging strangers, reciting poetry and looking for bird-shaped graffiti is not usually part of a city tour—but Moscow Game Tour is no ordinary company. Moscow Game Tour is one of a new breed of innovative tours run by and for young people. They are either low-cost or free, and prioritise interacting with locals over traditional sightseeing. Mr Bogdanov started Moscow Game Tour in 2009 to encourage visitors to explore areas outside the city centre. In the tour, which costs 700 roubles (about $22), participants are “players” and complete challenges that lead them to clues in the shape of a matryoshka doll. Many tasks involve asking passers-by for directions or trying a Russian phrase. Along the way, players discover interesting features such as a monastery canteen, or a Socialist Realist statue. Business has picked up as Mr Bogdanov has formed relationships with hotels, major tour agencies including TUI and companies such as Google. This year, he also began receiving support from Moscow’s Committee for Tourism and the Hotel Industry, which has launched a programme called “Moscow Fresh” to support creative tourism. Moscow Game Tour is one of a new breed of innovative tours run by and for young people. Source: Press Photo. In addition to the Free Tour and Game Tour, Mr Bogdanov’s company offers daily paid-for tours with a variety of themes. The retro Communist Tour visits central Soviet landmarks, including the Lubyanka (former headquarters of the KGB); the Gulag Museum; a Soviet-style canteen and Eliseevsky, a regal shop on Tverskaya Street considered the grandest store in the Soviet Union (which these days sells imported French yoghurt and other modern luxuries). Visitors can also venture below ground on the Metro Tour. The latter stops at some of the most ornate stations in Moscow’s beloved Stalinist metro system, such as the mosaic-adorned Komsomolskaya. In an attempt to supply visitors with information beyond the average pocket guide, the tour recounts little-known facts about the metro, such as how many babies have been born on it. Alexei Sotskov, 30, was inspired to start Moscow Greeter, a local franchise of the international Greeter network, after giving informal tours to friends. “I have a lot of friends in foreign countries, and when they come to Moscow I show them interesting places. So I thought it would be a great idea to start running a tourist service,” he says. Shirt sense: tourists can ask friendly local volunteers for help or follow clues. Source: Press Photo. The greeters are mostly students learning English who take visitors to lesser-known sights, such as the former royal estate Kolomenskoye, as well as exhibitions and sporting events. The greeters not only show the tourists around but they also chat to them. “Greeters talk about their lives, their parents, where they’re from in Moscow, and where they study,” says Mr Sotskov. Valentina Lebedeva, a second-year linguistics student, has been a greeter for two months. “When most people come to Moscow, they visit the Kremlin and everything, but they go back and they still don’t really get how people really live here,” she says. Another unconventional tour company, Lovely Russia, also strives to provide a more engaging experience for tourists. “A lot of the tours I saw being run by tour providers were really boring, just buses with large crowds of 60 year-olds,” says the company’s co-founder Anna Shegurova, 25. “There was not a lot for a younger crowd, a more off-the-beaten-path kind of thing.” Lovely Russia offers a variety of $22 tours in English. Locations include metro stations, Constructivist landmarks and a “Moscow as it is” outing that winds through the city’s side streets. At the end of the tour, guides suggest places where participants can enjoy a beer. Ms Shegurova says the guides try to show visitors “a different side of Russia”. “It’s a great city with a really long and interesting history… but you wouldn’t really know unless you have someone with you who’s able to share this history and make it interesting,” she says. For visitors without a guide, getting around Moscow can still be a challenge. Over the past year, some English-language signs indicating the locations of historical sights have been put up, but metro and street signs remain in Cyrillic. “Tourists can meet WowLocal at any part of the city and at any time – even at night in Butovo,” says Ms Tripapina, referring to the suburb south of Moscow. Since the project started in July, Ms Tripapina says it has recruited about 400 volunteers. She wears her badge every day on her way to work, and says she’s frequently stopped by foreigners asking for directions (as well as Russians looking for the metro). Occasionally, she fields some more unusual requests: “Once, a guy from Britain asked me where to get a bowl of pelmeni,” she says. 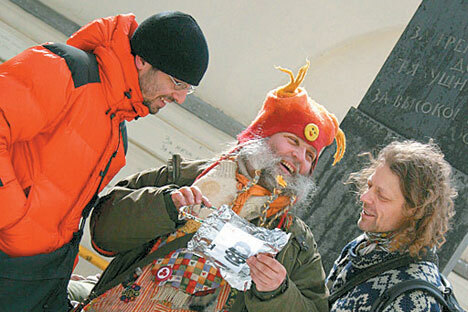 WowLocal also brings together local people and tourists through city navigation games and conversation clubs at hostels. “We bring volunteers together with the travellers, so that they can share with each other,” explains Ms Tripapina.